New Zealand rockers the Beths match garage energy with sweet vocals for a memorable debut album. Albums like Future Me Hates Me should come out at the start of summer rather than at its end, but they do things upside down in New Zealand, so maybe the timing's perfect. Regardless of the season, though, the driving pop-rock of the Beths should heat up speakers, with sugary melodies and energetic guitars making for an exciting debut. With one foot in the 1990s and one in the 1960s and both eyes looking forward, it's hard to imagine the album's title will hold true, but the smart lyrics reveal complicated insights that might keep all prognosticators guessing. That future self-opinion remains open because vocalist, guitarist, and primary songwriter Elizabeth Stokes (the only apparent Beth in the group) remains conflicted. She may not always be certain how she feels, but she knows how to express it anyhow. The title track draws on '90s indie rock for its sound while Stokes slowly caves into a new romance. She has her defenses up and knows the danger of letting them down, singing, "But it won't happen again / It probably won't happen again." She's torn between the safety of her hermetic life and the excitement of a new someone, and as she allows herself to risk "future heartbreak", the guitars open up their sound, offering as much approval as the "woo" backing vocals. Those backing vocals provide an important element of the band's sound. The band members, all trained in jazz (not that it shows), bring their music out of the garage, offering the poppier side of punk, but the vocals add some of the sweetness. These aren't the sorts of harmonies you notice for their complexity, but for their exuberance; everyone sounds all in on everything. On "Happy Unhappy", the wordless vocals simply set the mood as Stokes again stumbles into a relationship, but the echoing words sound like her subconscious, her bandmates accepting her excitement before she does. Stokes sings, "'Cause you're in my brain / Taking up space I need for / Delivering lies and / suppressing the sighs," making the second litany of things she needs her brain for more personal, revealing the guards coming down. Stokes really does sing about more than struggling with new love, and the band knows how to follow. When "River Run: Lvl 1" deals with a break-up, the other singers fit their parts together with the sensibility of an a cappella group (while playing like they've listened to Blink-182). When things fall apart on "Uptown Girl" and Stokes blows off steam, the Beths provide the energy and even the humor for it. It's a tumultuous album, full of ups and downs and people occasionally being left. The band changes moods carefully, although that's an adverb not apt for their demeanor. In the world of the Beths and Future Me Hates Me, the world is just a bit chaotic, and internal process a little more so. All of that can be addressed by ordered lyrics with a touch of comedy and light-handed self-reflection. And it can be expressed by guitars and pounded drums. To Stokes and her bandmates, the future looks a little scary and a little hopeful, but certainly nothing that a good hook (and a good night out) can't handle. 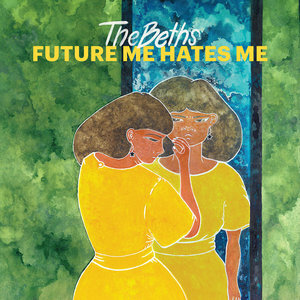 For a band so adept at expressing ambivalence, the Beths should see a future that won't despise this present at all.